Mark Bamford's Honours Project Blog. For a proper collision response, a normal to the surface is required. 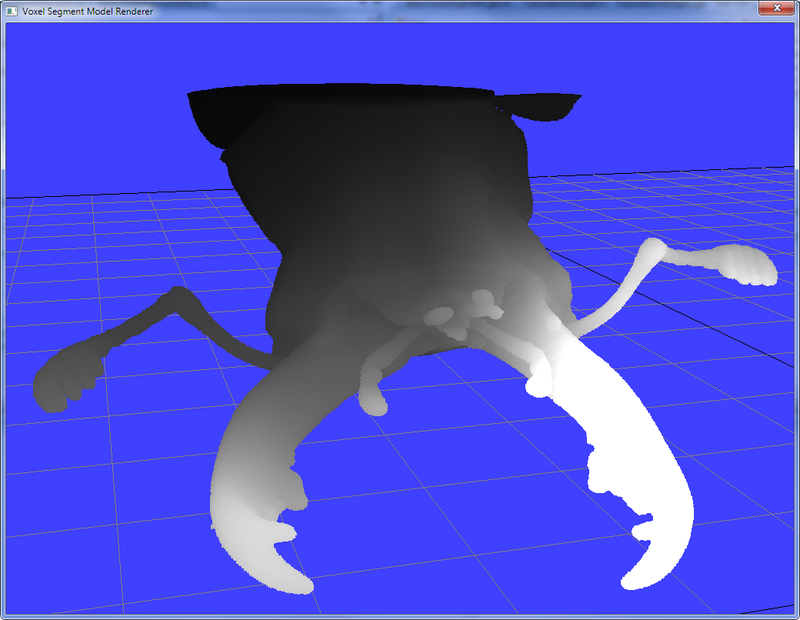 Easy fix, calculate the normals on the fly when they are needed! Sample the points surrounding the point on the surface. This gives 9x9x9 points (if you include the point itself). For each of these points, if it is filled, move the normal away from the sampled point. 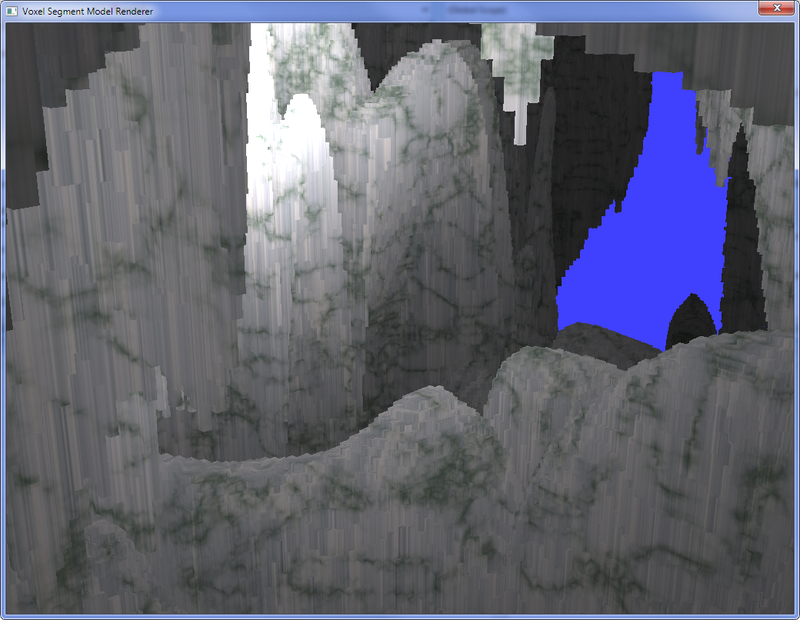 Doing this I have managed to achieve a very nice collision response to any point on the surface. I've finally moved away from working on the rendering side of things and have managed to implement a point collision detection system. 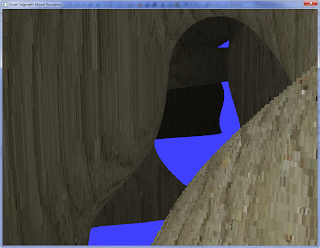 To do this I have a slightly decompressed version of the voxels in main memory (for use on the CPU not the GPU). I decided it was best to do the collision detection on the CPU since the GPU is already struggling with the insane number of triangles. 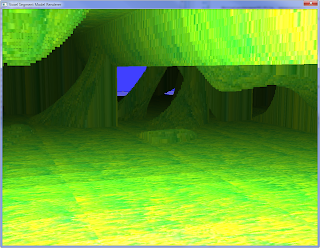 The CPU version of the data is stored as start and end indices of the voxel segments. Since these are in order I am able to binary search the data. 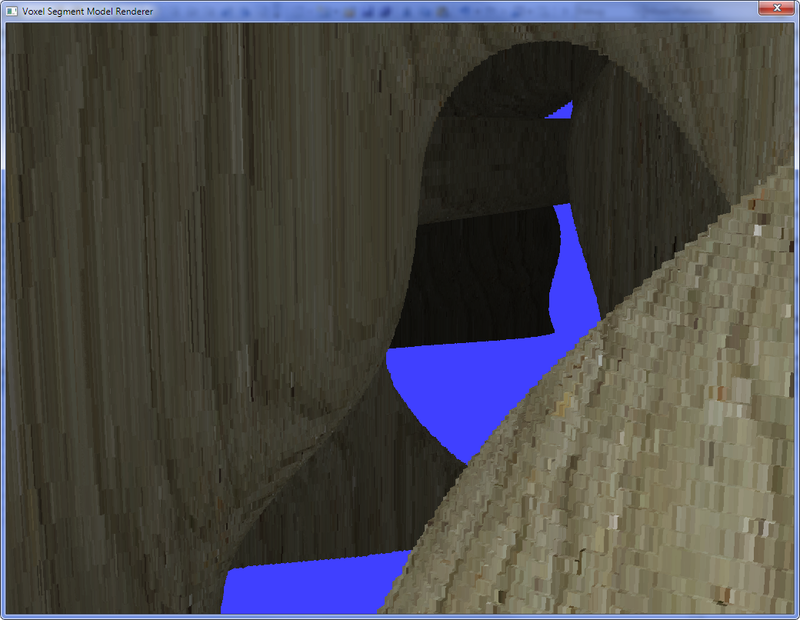 Giving me O(Log2(N)) access to voxels. 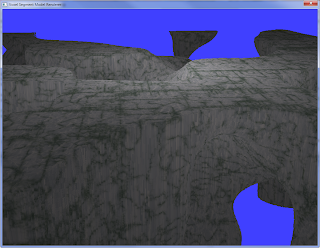 This allows me to check whether a single point is filled or empty, therefore providing point collision detection. I am trying to think of a way to check for intersections with shapes without checking per voxel but I'm not sure how this could work yet. In an attempt to create a more interesting landscape, I had an idea. Offset the time values of 3D Brownian Motion with the results of a 2D slice of complex fractal. Shown here is the results of a Rigid Multi Fractal. A fair bit larger file than the previous landscape but it contains a lot more detail. This mixes 3D Perlin Noise Turbulence with a 2D detail image to attempt to create an appearance of rocks covered in moss. They were cause by the way I was storing the fragment positions. I resolved the issue by changing to recreating them from the depth buffer. This combined with the previously mentioned dFdx/y functions creates perfect deferred texture filtering. Also I've altered and simplified my compression it now uses fixed size run length codes (unsigned short (2 bytes)) which has reduced file sizes by a few megabytes. This "landscape" consists of 512 * 512 * 300 = 78,643,200 voxels. Its file is 1.56MB = 1,643,755 bytes. Therefore, a 78 times reduction. 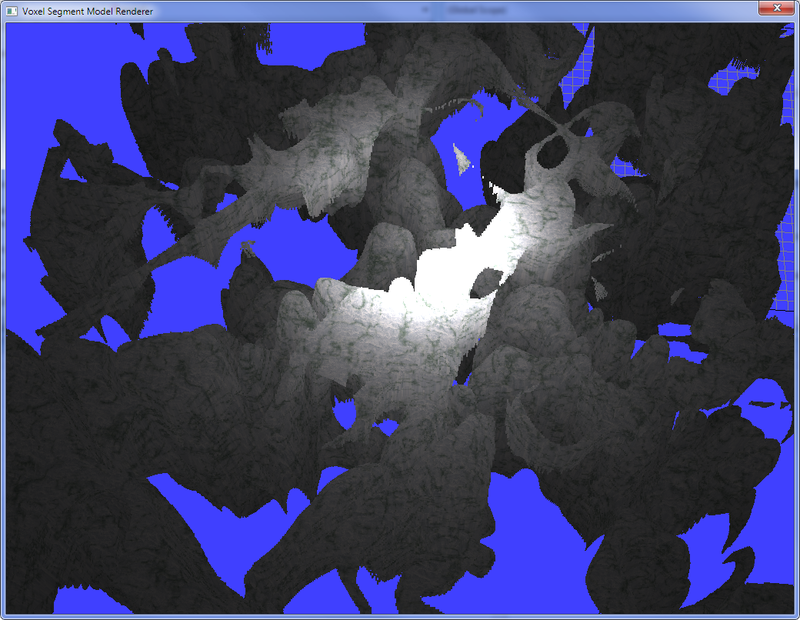 Also, pictured is deferred texturing and lighting, with point light at the camera's position. Note to Erin: slightly improved texturing by using the glsl functions dFdx and dFdy with textureGrad. Copyright © 2011 Mark Bamford. All Rights Reserved. Awesome Inc. theme. Powered by Blogger.